I recently celebrated my birthday. I went out for lunch by myself to the Cheesecake Factory and in the course of talking to one of the servers, let slip that it was my special day. I assured everyone that I did NOT want anyone singing Happy Birthday to me. 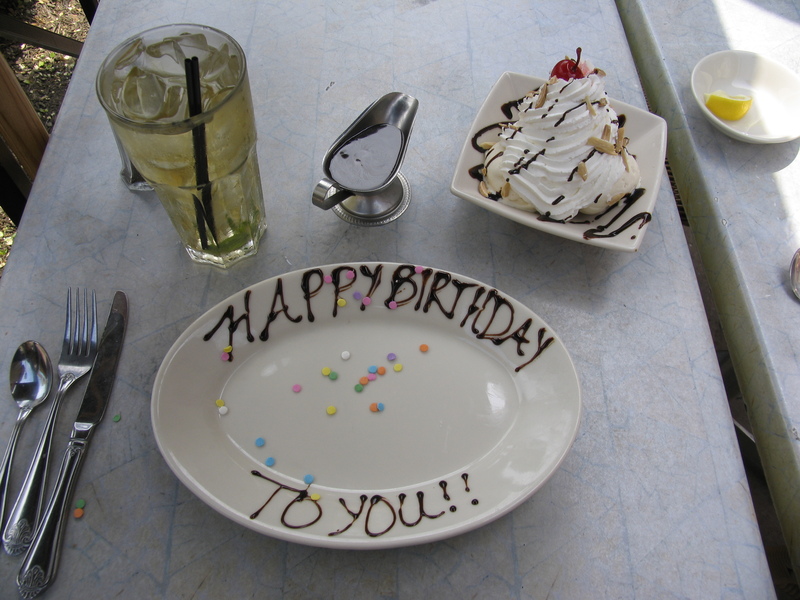 My waiter – a great guy named Chris – made it a special day anyhow using these twenty characters. I counted twice and was amazed to see that it was equal to today’s word. Isn’t that just great! Word for tomorrow – BACKSPACE. If you prefer to work ahead, see the list for the week under “A Word A Day”. That is so precious. May life always grant you such pleasures, complete with a cherry on top! You do a great job keeping us inspired on this 365 project. Thanks for all your time and comments. Thanks for the blessing! And you are welcome. Thanks Mom! It was fun being on my own that day. I love the Cheesecake Factory. Happy belated birthday. Thanks! I had a great birthday. It’s really special to live so close to the Cheesecake Factory and be able to go whenever I want.